Hexachlorophene, also known as Nabac, is an disinfectant. The compound occurs as a white solid (although commercial samples can be off-white) and can be odorless or possess a slightly phenolic odor. In medicine, hexachlorophene is very useful as a topical anti-infective, anti-bacterial agent, often used in soaps and toothpaste. It is also used in agriculture as a soil fungicide, plant bactericide, and acaricide. At least two companies manufactured over-the-counter preparations incorporating hexachlorophene. One product was Baby Magic Bath by The Mennen Company. Mennen recalled the product in 1971, and it was removed from retail distribution. Immediately after the withdrawal, there was an outbreak of Staphylococcus infections in hospitals across the USA. Two commercial preparations using hexachlorophene, pHisoDerm and pHisoHex, were widely used as effective antibacterial skin cleansers in the treatment of acne, with pHisoDerm developed for those allergic to the active ingredients in pHisoHex. In the US during the 1960s, both were available over the counter. After the ban was enacted, pHisoDerm was reformulated without hexachlorophene, and continued to be sold over-the-counter, while pHisoHex, which contained 3% hexachlorophene (three times the legal limit imposed in 1972), became available (and remain available today) as a prescription body wash. In the European Community countries during the 1970s and 1980s, pHisoHex was available over the counter. A related product, pHisoAc, was used as a skin mask to dry and peel away acne lesions. Another preparation, pHiso-Scrub, was a hexachlorophene-impregnated sponge for scrubbing, has since been discontinued. Several substitute products (including triclosan) were developed, but none had the germ-killing capability of hexachlorophene. Sanofi-Aventis was the sole manufacturer of pHisoHex, while The Mentholatum Company owns the pHisoDerm brand today. Sanofi-Aventis discontinued production of several forms of pHisoHex in August 2009 and discontinued all production of pHisoHex in September 2013. The formula for Dial soap was changed to remove hexachlorophene after the FDA put an end to over-the-counter availability in 1972. Hexacholorophene is produced by alkylation of trichlorophenol with formaldehyde. Related antiseptics are prepared similarly, e.g., bromochlorophene and dichlorophene. The LD50 (oral, rat) is 59 mg/kg, indicating that the compound is relatively toxic. Its usefulness has been limited by this toxicity, not other factors such as mutagenicity nor teratogenicity. 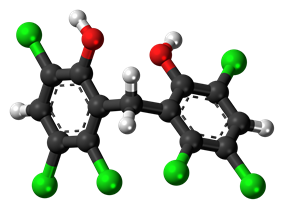 Trade names for hexachlorophene include: Acigena, Almederm, AT7, AT17, Bilevon, Exofene, Fostril, Gamophen, G-11, Germa-Medica, Hexosan, Septisol, Surofene. ^ a b c Fiege, H.; Voges, H.-M.; Hamamoto, T; Umemura, S.; Iwata, T.; Miki, H.; Fujita, Y.; Buysch, H.-J. ; Garbe, D.; Paulus, W. (2000). "Phenol Derivatives". Ullmann's Encyclopedia of Industrial Chemistry (Weinheim: Wiley-VCH). ^ Germicide Limit Stirs Confusion, New York Times, September 24, 1972, pg. 53. ^ a b The Milwaukee Sentinel: "US Order Curbs Hexachlorophene" (UPI), September 23, 1972. From Google News. ^ a b Ocala Star Banner, "15 Deaths Cited In Use of Germ Killer, Hexachlorophene" (AP), March 21, 1973. From Google News. ^ Dixon, RE; Kaslow, RA; Mallison, GF; Bennett, JV (1973). "Staphylococcal disease outbreaks in hospital nurseries in the United States--December 1971 through March 1972". Pediatrics 51 (2): 413–7. ^ "Hexachlorophene". PharmGKB. Retrieved 2012-012-28.